We have recently set up the Rare Star iPad for music apps and one of the key reasons why the iPad is such a useful machine for music | audio production, practice or performance is that its size, weight, portability and flexibility are so improved in comparison with a lap or desk top computer. 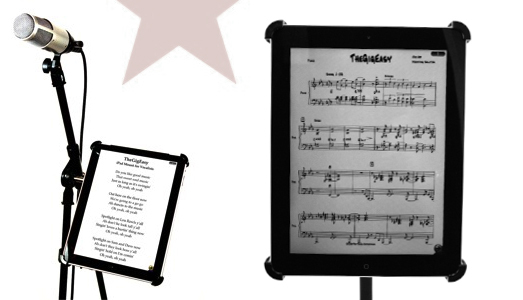 The first thing any guitarist, drummer or instrumentalist will usually want to do is attach their iPad to a music stand – securely. TheGigEasy Mic Stand Mount attaches your iPad to any microphone stand and uses spring-loaded arms to grip the iPad securely. The housing also features 360º rotation, to move from landscape to portrait viewing modes and a tilt mechanism for one-handed adjustment of the iPad’s viewing angle. There is also a side mount extension arm that clamps to any tubing up to 1 1/4” in diameter which means if you are a drummer you can fix your iPad to your kit. Gig Easy also produce a host of other iPad mounts including flexible mic stand mounts, suction cup, Manhasset, and flex clamps. No matter where you play or make music you can still take your iPad. Notable users include Herbie Hancock, Steve Martin and Ric Ocasek of The Cars, as well as Dream Theatre. – the Gig Easy website is here. 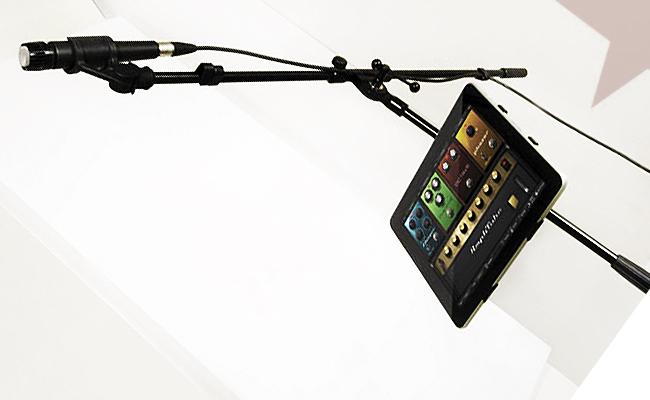 IK Multimedia (producers of the iRig iPad guitar interface) have also produced the iKlip: a versatile iPad mount that fixes to either the vertical or boom arm of your microphone stand – the IK Multimedia website is here. 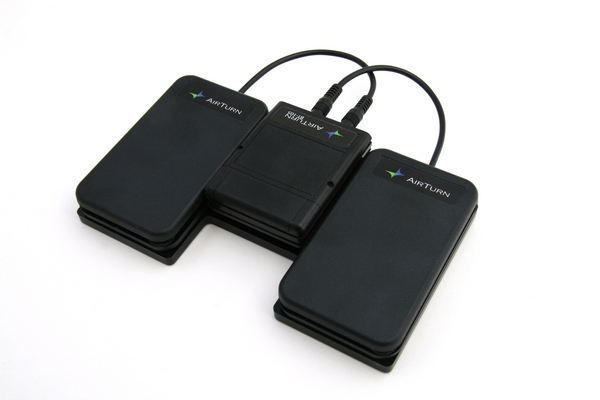 The AirTurn dual footwitch iPad kit is silent and perfect for hands free iPad control – click here.